I love reading changelogs and Xcode updates are no exception. I am fascianted by Apple’s approach to Xcode improvements because they rarely add a feature without reason. Oftentimes they tackle developer workflow weaknesses and implement related tools and resources to aid in those troubling areas. Historically, one such pain point has been debugging views and visual layouts. 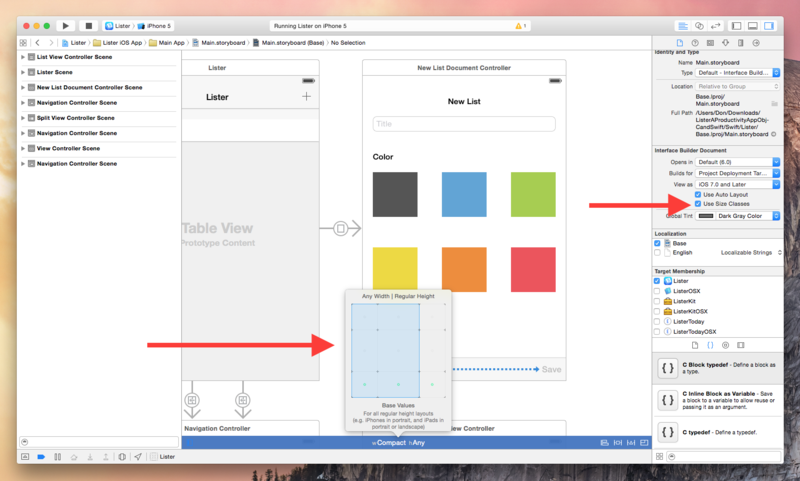 Even simple apps can grow into complex view hierarchies and now Xcode 6 implements a new feature to visually explode the layers of the current screen giving you a birds-eye view of every UI element. The example below is a simple table-view list of items that have been exploded in Xcode 6. Each layer is selectable giving you quick access to the hierarchy and constraints that positioned that view. This feature is not unlike the already popular Reveal app which is also worth checking out. Another addition to Xcode that aims in help developers visualize views are the new IBDesignable and IBInspectable properties. IBInspectables are attributes that become exposed inside of Interface Builder, allowing you to visually tweak your own custom views. The IBDesinable property is what provides the live rendering in Xcode. There is an excellent write up that goes in to greater detail at weheartswift.com that is definitely worth reading to help you get started with these new features. In addition to the mechanisms Apple added to help developers troubleshoot layouts, they also added quite few to help build modern and responsive user interfaces. 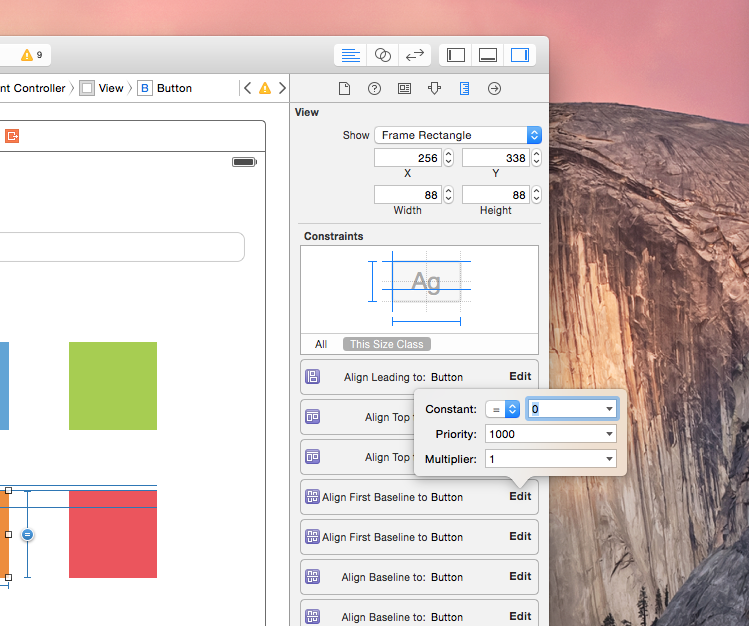 These would of course be improvements to Interface Builder’s Auto Layout features as well as the new iOS 8 Size Classes. The growing number of devices with varying screen sizes has pushed Apple to simplify the development process of interfaces with these new classes. Developers can use them to create a single UI that will work across all applicable platforms. Getting started with size classes is as simple as converting your existing storyboard files by enabling the “Use Size Classes” checkbox. You will notice a new option in the bottom toolbar of Interface Builder that allows you to adjust the width or height traits of the interface. Adjusting these attributes will give you an idea of how your layout will respond to the orientation and screen size changes. 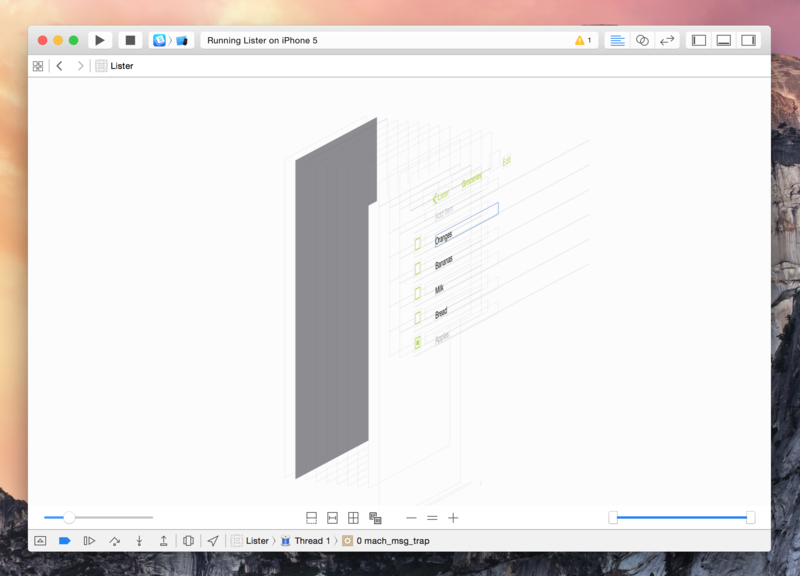 In order to take full advantage of iOS 8 size classes, you must adopt Auto Layout. Auto Layout, Apple’s constraint-based UI layout system, is nothing new but with each release it receives many incremental improvements that make it a very tempting technology to adopt. Some of these improvements include Interface Builder additions like the visual layout guides in the right-hand toolbar and the quick popover to edit constraint constants as shown below. Now while all of these enhancements are useful and contribute to a more productive development environment, they are trumped by the biggest news to come from this year's WWDC keynote and that is the new programming language called Swift. For the first time, Apple has a blog where they can relay information about the evolving language. They also have a section dedicated to Swift resources to help you get your feet wet in the new language. Aside from Apple, many smart community members have taken to the Internet with useful tutorials and examples of new iOS 8 APIs and techniques for writing in Swift. The purpose of this issue is neither to give an introduction to Swift nor to present best practices when writing Cocoa/CocoaTouch apps with Swift. For the former, there is Apple’s documentation, and many other resources are coming up. Regarding the latter, the language is way too young, and none of us have had enough experience to confidently talk about best practices. Instead, we’ll focus on some aspects of Swift that are new and potentially very foreign to Objective-C developers. If you are more of a visual learner, definitely check out NSScreencast. I have written about the service in the past but I am a subscriber and can vouch for its quality. They already have 7 Swift videos online and a plethora of other useful topics to watch as well. On the topic of learning, Apple introduced one of the greatest advancements to ever come to Xcode and that is Swift Playgrounds. 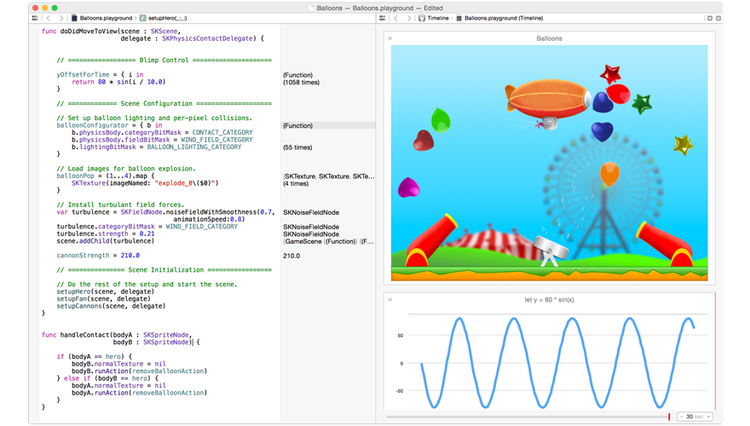 Playgrounds allow you to practice writing Swift code while Xcode evaluates and prints the results in real-time. The benefits of instant feedback are amazing when learning a new language. This will certainly lower the starting hurdle for youths interested in programming as a career. You can show some one tiny snippets of code or entire functional programs that come alive right inside of Xcode. That is HTML formatted with CSS in a file with Swift code that will compile and change results as you edit it. It is a truly fantastic way to learn and I am excited to see how the community puts them to use. You can view that entire Playground on Apple’s blog. The new Xcode 6 goes beyond incremental improvements to give developers the tools necessary to build truly magnificent apps. Although I only touch on a small fraction of features, Interface Builder’s new Auto Layout enhancements, live rendering, view debugging, and Swift support is a huge win for all developers. If you have any Swift related resources you have found useful, feel free to share! 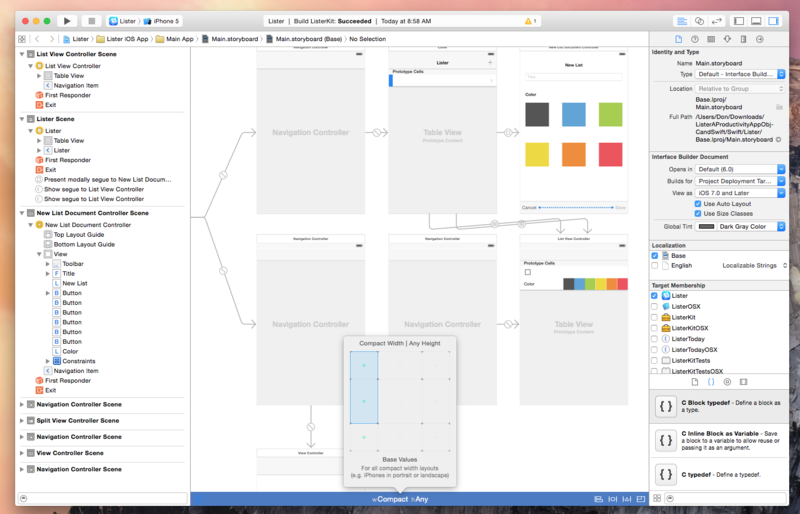 Xcode 6 is available in the Mac App Store as a free download.